It takes a lot of guts to start your own comic. A creator has to have a vision, yes, but the real courage comes from tirelessly resolving all the little details that any creative project entails: creating, revising and ultimately launching your work into a field saturated with uber-talented creators who (you fear) might just be better than you. But courage, of course, is not what makes a good comic. Storytelling and art is what makes a good comic. And Farlaine the Goblin is pretty damn close to having both. This is a fairy tale. Farlaine the Goblin, a tree goblin shaman from the Forest of Fin-Din, has spent years wandering the many Oddlands of Wug in search of a forest to call his own. 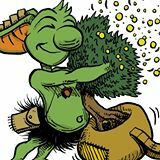 His only companion is Ehrenwort, a magical tree he can talk to and which connects him back to the magic of his home…He only has 10 lands left to explore of the hundreds he started with. First off: Farlaine the Goblin is a gorgeous glossy. It’s larger than the average comic, and for a self-published title has both the heft and editorial care of an established book. All of this would be for naught, of course, if the story was poor. But it’s not. We’re introduced to a spectacularly imaginative world where a tree goblin wields powers similar to Swamp Thing, navigates kingdoms reminiscent of Willingham’s Fables, and encounters villains you’d only expect to find a few paces off the yellow brick road. 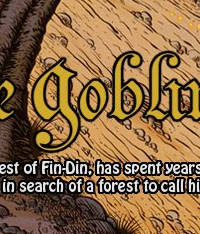 This is all to say that Farlaine the Goblin is marketed accurately: this is a fairy tale. And so far, a well crafted one. When setting out to introduce such a complicated and magical world it would be easy for most writers to ram the novelty of their creation down your throat. We’ve all read premiere issues that feel less like stories and more like infomercials advertising the powers a new superhero wields (but in a way that seems detached from story or narrative arc). That’s not the case here. Story comes first; powers second. Farlaine’s abilities are revealed only when the story dictates, which is how it should be. And the story is compelling: a goblin looking for a home, and with few options left. There’s strong moments of art in Farlaine the Goblin #1. We’re treated to some spectacular panoramas and richly drawn characters, but as with any premiere issue, you sense that the artist and character are still getting to know each other — Farlaine looks more rigid in some shots than others, and in truth, this is the only drawback of the book. At times Farlaine is naturally rendered, other times he looks uncomfortable in his own skin. This is entirely forgivable drawback, however, given the newness of this project. Even Watterson’s Calvin didn’t look like Calvin back 1985, and it often takes a while for an artist to learn his or her characters. But back to the creative process, and to courage. I would argue that Farlaine the Goblin is not only a good book, but a courageous one (and not just because the writer/artist got it launched). Rather, it’s courageous because the writer/creator decided to launch this thing anonymously. No joke — I have no idea who this person is, or why they don’t want us to know. In an industry where folks sometimes take credit for work they didn’t do, and where self-promotion is expected, this anonymous approach feels truly counter-cultural. And, to be honest, a little odd. But I’m more intrigued than put off by it. And I’m really curious to see how the creator will leverage his or her anonymity later on. It’s hard to know where Farlaine the Goblin will go, or if the writer/artist will be able to keep up the momentum of this title, or the anonymous mystery surrounding it. But as far as premier books go, this is something special. Go find it here. Max Delgado is the founder and curator of The Longbox Project (@LongBoxProject), a memory project where comics are both inspiration and point of departure. You can check it out here. Congrats on the great review cousin. We were all proud of him for publishing the comic and are happy for the great review. Great review… I have to say I do know the author personally, and have even got the chance to give some feedback on artwork and story lines, he takes things into consideration. I’ve seen iterations of Farlaine for a while now and it it’s great to see him evolve, and I’m sure he will further evolve as it becomes more popular! You say it’s odd to be Anonymous, well that’s true, and you don’t know the Author :). Great friend, great guy, and yes Odd , and that’s why we love him.. Keep up the good work !! I think you’ll be pleasantly surprised with the next 2 issues, I want more already, maybe I’ll sneak some more info out of him, but alas, I cannot share..